From Maryland to Texas, you'll pick up tips and techniques that will make your goose hunting more enjoyable and successful. On the eastern shore of Maryland, Grits has world goose calling champion, Sean Mann, demonstrate calling techniques for both huntin A Sportsmen on Film DVD production. From Maryland to Texas, you'll pick up tips and techniques that will make your goose hunting more enjoyable and successful. 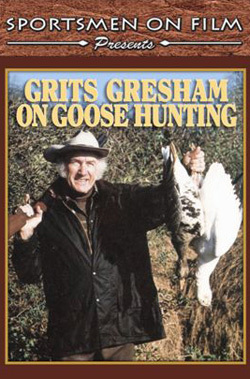 On the eastern shore of Maryland, Grits has world goose calling champion, Sean Mann, demonstrate calling techniques for both hunting and contests. And outfitter-guide Art Ayers shows Grits the decoys and blinds that are effective for hunting Greater Canadas.Then, in the rice fields of Texas, Grits hunts Snows, Specklebellies, and Blues with his son, Kent, outfitter-guide Pat Johnson, and Charles Barry. The decoys are different, the spreads are different, and the hunting techniques are different, but the results are the same...a great hunt and geese for dinner.